Absolutely! After being in this industry for ten years, I have a vault of the best products, tips and tricks that will not only have you look like the best version of yourself but will guarantee that it will last till the end. Do I need to schedule a Trial? To ensure your desired look on your wedding day, a trial or what I like to call ‘Preview Session’ is recommended. Tell me all about your wedding dress, flowers and décor, and how you usually wear your hair and makeup for a special occasion. I will listen and guide you toward the style that suits you best. Throughout the trial, I will take detailed notes and photos so that when your wedding day comes, I am fully prepared and ready to recreate the look. Because I want to make sure you find your ultimate bridal look, you are always welcome to contact me for advice on how to get the most from your trial. Plan for 60 minutes for each service. *I recommend that you book your wedding day before your preview session, to ensure availability. What do I need for the Preview Session? To best design your wedding day look, bring what you like to the Preview Session. For example, photos of makeup & hair inspirations (that you love or even that you hate, this ensures that we we are on the same page), a photo of your wedding dress, accessories, colors, or theme to your wedding. Come with a clean face and freshly washed and have your hair washed and blown out the night before. *For portfolio work there will be a ‘before & after’ photo taken. Should I get Airbrush or Traditional Makeup? In order to choose which product/application is best for you, I like to discuss the following topics with you in order to determine which will suit your needs best. Never heard of Airbrush Makeup before? 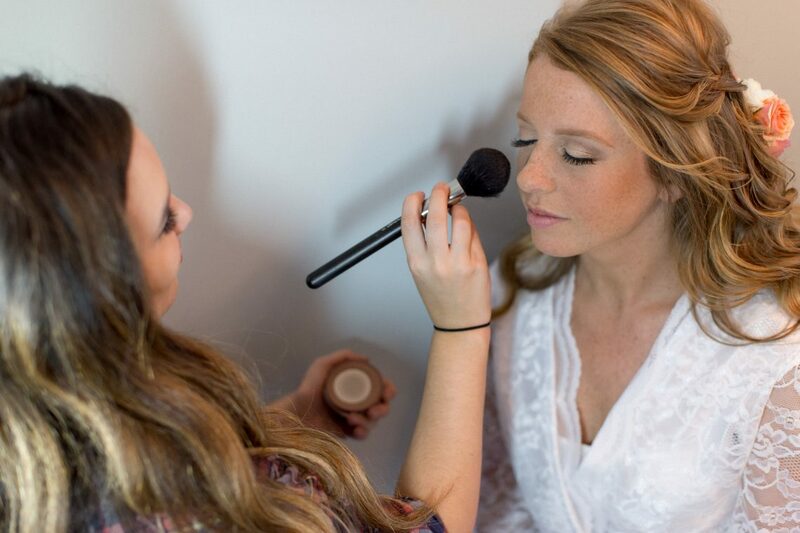 Click here for some more information about Airbrush Makeup. Do I need eyelashes for my wedding makeup look? There are not many things I insist on, but adding false lashes to your wedding look is a must! (That is why we include them in all of our makeup application services!) Eyelashes open up the eyes, they help them to appear wider and brighter. Eyelashes come in two different applications, strip lashes or individuals – and we love them both! Looking for something a little more dramatic for your bridal look? Check out our favorite eyelashes and purchase them for your big day! How do I know how long everything will take? Each service has an allotted time frame (for details click here), when trying to determine start time consider each member of the party and what they will require. A schedule will be created for you to confirm before your wedding day. I believe that good preparation is the foundation for long-lasting hair and makeup, so I have built extra time into the schedule. You won’t feel rushed, because with this system, the process is smooth and chaos free. I do request everyone be ready upon arrival to keep the day running smoothly. *For parties larger than 7 people, additional stylists/artists will be provided depending on availability. Should you have a specific stylist in mind please make note in your contact form. When more than 2 Stylists/Artists are required you will be subject to a $50 fee per Stylist/Artists. Should my Bridal party have their hair and makeup done? Absolutely. A professional artist can help to bring beauty and symmetry to all of your bridal party. Everyone will have a professional & beautiful look. It also makes a great gift! Please contact me if you’re interested in giving a Gift Certificate for services. Mother of the Bride and Mother of the Groom often prefer to have their hair and makeup done by their regular stylist/artist as they are most familiar with their preferences. Is there a minimum number of people required to book my wedding day? There is a minimum of (3) people needed in order to book your wedding date. What time should we be ready by? Let’s keep your day running smoothly by allowing me to help you plan your wedding day time frame. I will need to know the number in your party, along with the hair and/or makeup services they desire and the time everyone needs to be ready. Include all of this information on the “Save the Date form”. If you are uncertain of when you should be ready by, touch base with your photographer as they will have a pretty good idea of how the day should run. As a courtesy all work provided on location within a 10 mile radius of 13413 is free of charge. Tolls and parking charges will be additional.